An approximation for front and rear dynamic weight can be determined from longitudinal acceleration and values for the wheelbase and center of gravity position. 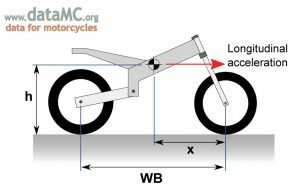 Now that we have looked at static weight distribution and also found how cornering forces add to the total weight of the motorcycle and rider, in this post we will show how total weight is distributed between the front and rear wheels. As the motorcycle accelerates, weight is transferred from the front wheel to the rear wheel; under braking, weight transfers from the rear wheel to the front wheel. Note that the acceleration and braking forces act on what we have designated the total weight of the bike and rider, which includes cornering forces. The amount of weight on each wheel depends on a number of factors. Using GPS longitudinal acceleration data, approximations can be found that show how the total weight is distributed when the motorcycle is accelerating or braking on level ground. 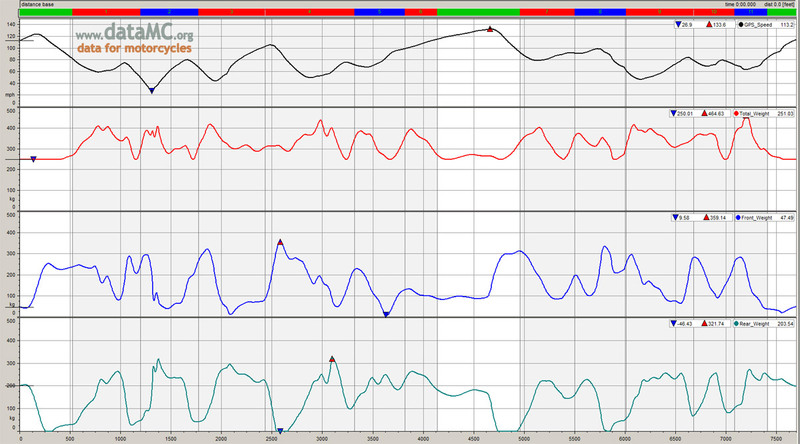 This chart shows data for speed (black), total weight (red), front weight (blue) and rear weight (green). Note that in some braking areas that rear weight goes negative, indicating the rear wheel may be off the ground. Note that the first portion of each equation represents the static distribution of the total weight determined by the horizontal position of the center of gravity, while the second portion represents the weight transfer due to acceleration or braking and is dependent on the height of the center of gravity. A higher center of gravity will cause more weight to transfer under acceleration and braking. Note also that he sum of front and rear weight must always equal total weight. The same front and rear weight data from the previous chart is shown, this time along with front (blue) and rear (green) suspension data. The weight and suspension data show some distinct similarities, even though the weight calculations were made using broad approximations. Further refinements can be made to the weight data to improve this relationship. 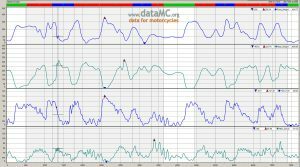 Weight data can be used to show, for example, how much the front wheel unloads under acceleration; a negative value indicates a wheelie. Similarly, a negative value for rear weight under braking shows the rear wheel may actually be lifting. 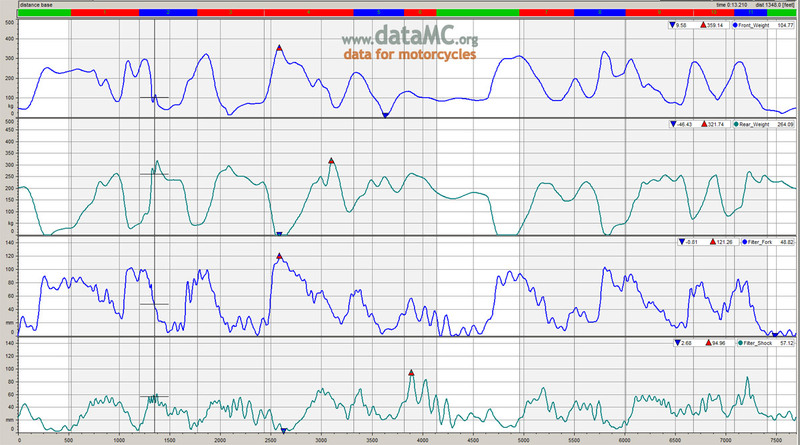 Additionally, front weight data can be used to see how much the rider is loading the front tire during trail braking, while rear weight data shows how the rider combines acceleration and cornering forces at corner exits. All this information can be especially useful when determining what happened in the moments before a crash. While these basic math channels are very approximate, note in the attached data traces how the weight channels correspond to suspension travel data. 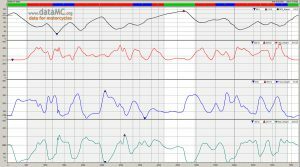 If you do not have suspension pots and actual data for travel, the weight channels can be used for some insight into the suspension. With more data and more elaborate calculations, this relationship can be even further refined.